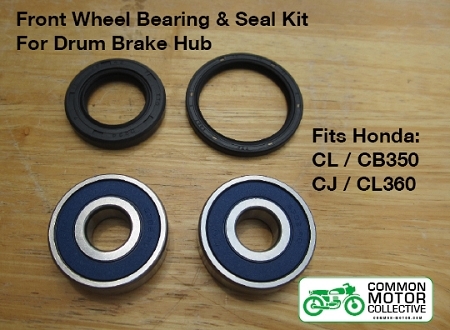 Part: Honda CB350 / CL360 Scrambler / CJ360 Wheel Bearing Front (Drum Brake Models) - includes Dust Seal and Speedometer Seal. Why You Need This: Wheel bearings do some serious work on your Honda CB350 or CL360, yet they are often overlooked when it comes to time for service work. Wheel bearings can wear in multiple ways, anywhere from running dry, high mileage or subject to the elements via neglect. 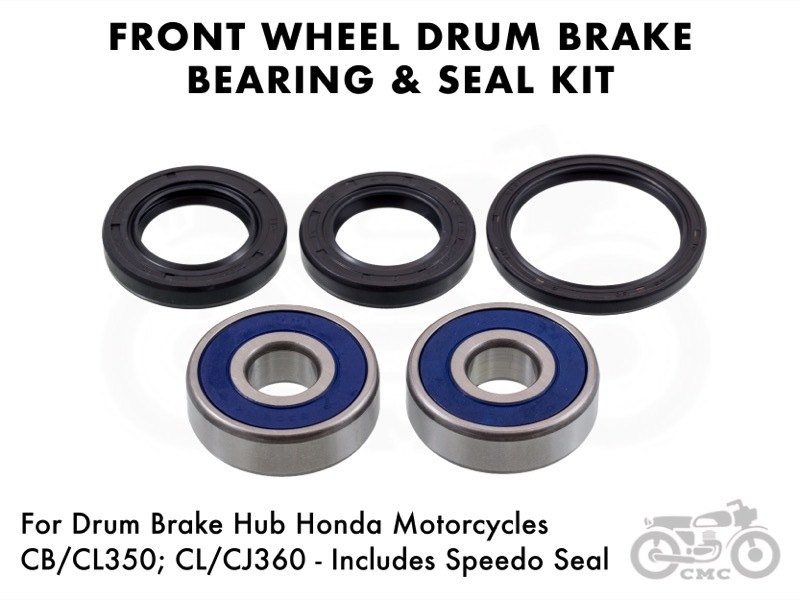 If the front wheel bearings on your Honda CB350 or CL360 are oozing grease, feel "crunchy", or if the wheel has lateral play (back and forth movement perpendicular to the axle) or is not turning smoothly that is a sign for wheel bearing replacement. New bearings will keep the front wheel running true for accurate steering control. 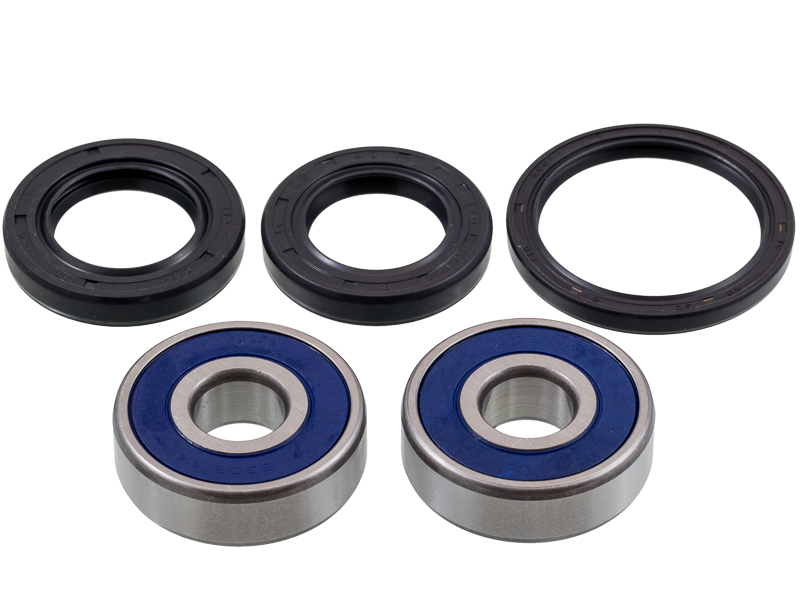 Our front wheel bearing kit comes with a fresh pair of pre-lubricated wheel bearings and a new seals for the speedometer drive and drum. While you have the front wheel apart it might be time to rebuild your front brake with from new brake shoes or put some new rear wheel bearings in too! Installation Tip: Use a heat gun to heat the hub when removing the old bearings. Use a long punch to drive out the old bearings and then use a large socket or tube as a driver tool to install the new bearings. Make sure that the socket or tubing used for the driver tool matches the diameter of the outer race of the bearing; this is the proper way to press in the bearings. If you press in the new bearings by pushing on the inner race or the blue dust shields you will damage the bearing during installation. I made the mistake of buying this from someone else because it was "cheaper". They turned out to be wrong so I bought them form CMC and of course they were right, as always. I wont stray again.